Eep! I’m so excited about this recipe that I want to hit publish and share it with you right this minute. I know how much you enjoy spicy sweet potatoes, black beans and avocado together—you all have such good taste—and I’ve already been keeping this one under wraps for a few weeks now. I should probably tell you the story behind these tostadas. A few months ago, I went on a fun girls’ weekend trip to Nashville with a couple of friends. We all share equal enthusiasm for good queso, margaritas and tacos. Thanks to Yelp’s infinite wisdom, our hungry and thirsty selves landed at a restaurant called Bakersfield for a very late lunch. Apparently it is a small chain. There, we promptly ordered a pitcher of apple margaritas and some truly spectacular queso. I settled on the “papas,” their black bean tostadas, and some portobello tacos. I loved how they served their tostadas on a bed of romaine lettuce. Tostadas are inherently tricky to eat. Do you pick them up? Try to break through the crispy tortilla with a knife? The romaine offered the perfect solution. Take a fork and knife to the tostadas, which is a lot easier to do with lettuce padding the underside. Plus, the romaine is crisp and fresh, which are two essential components to a great tostada (or taco, for that matter). So, I took notes, and those tostadas combined in my head with my sweet potato tacos and burrito recipes. 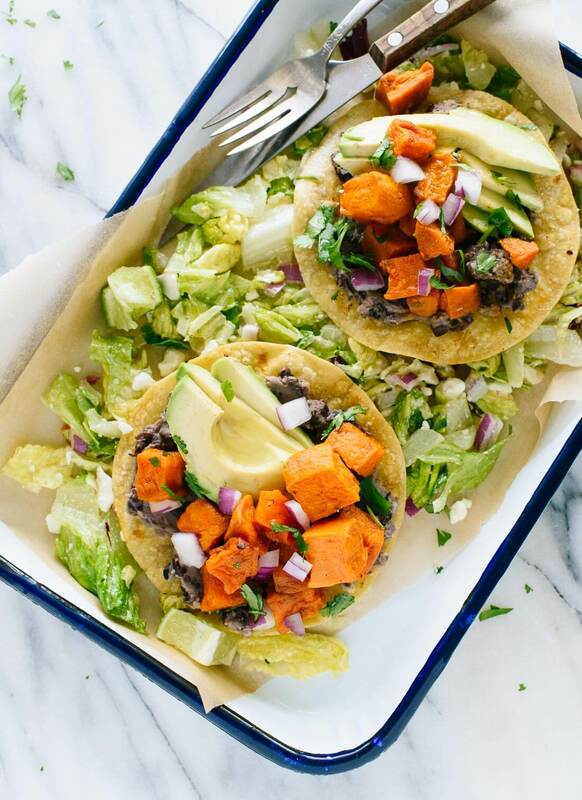 We ended up here, with crispy baked tortillas spread with “refried” black beans, topped with spicy roasted sweet potatoes, avocado, and fresh cilantro, all served on a bed of lime-and-feta romaine salad. I just know you’re going to love them. These tostadas are a very hearty vegetarian dinner option. The recipe as written yields quite a lot of food. If you intend to have leftovers, I’d store the components separately (wait to dress the lettuce just before serving, if possible). Perhaps the coolest feature of these tostadas is that I bought all of the ingredients at ALDI, one of my go-to grocery stores. ALDI is different from your average grocery store, but it will feel familiar if you have ever explored grocery stores in Germany (my first ALDI experience was in Germany during my semester abroad) or elsewhere in Europe. The first difference you’ll notice is that you’ll need to insert a quarter to get a shopping cart, which is refunded when you return it (a brilliant incentive to return the cart to its proper home). You’ll also want to bring your own bags, and be prepared to bag up your items. Those are a couple of ways that they keep costs down, which you will definitely appreciate when you see how low your total is at check-out. I appreciate ALDI because their products are super affordable, and they now offer a wide variety of my favorite ingredients. 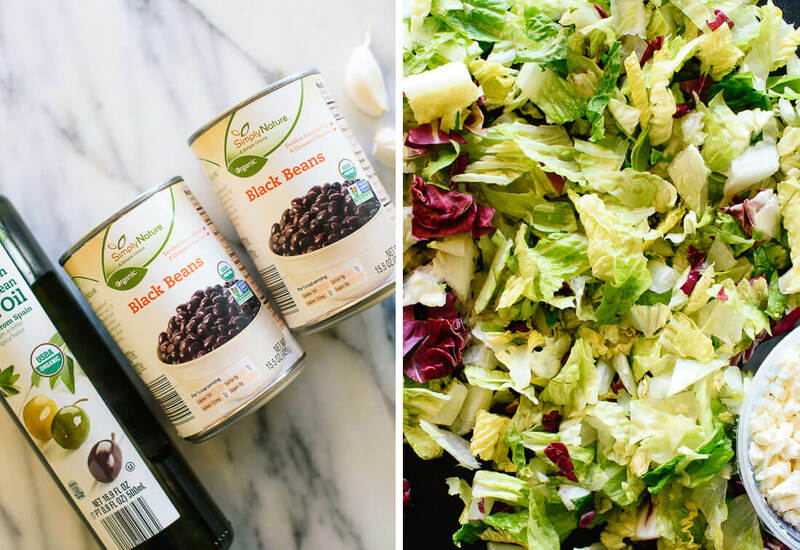 Their organic options include spinach and mixed greens, frozen berries, coconut oil, honey, milk, canned beans, salsa and tortilla chips. You can also find quinoa, a wide variety of cheese (all rBST-free), cheap avocados and limes (hello, guac!) and lots of other fresh produce. I’ve introduced some friends to ALDI and now they shop there all the time. Since I’m always trying to show that home-cooked meals can be healthy, affordable, and doable all at the same time, I’m excited to announce a new partnership with ALDI. I’ll be sharing three more recipes using ALDI ingredients over the next couple of months. If you haven’t experience ALDI yet, go explore one and let me know what you think! 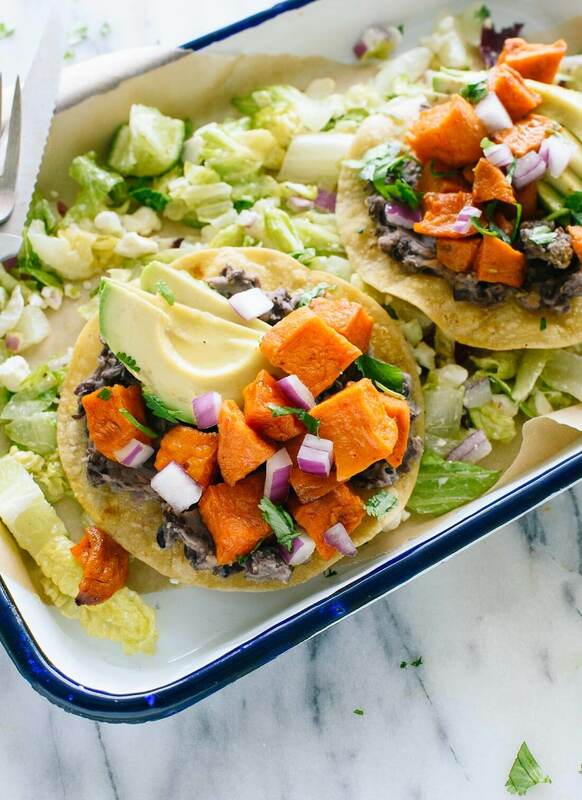 Also check out their new Hello, Healthy blog, which offers meal plans, videos and recipes from bloggers like me (these tostadas made the cut). 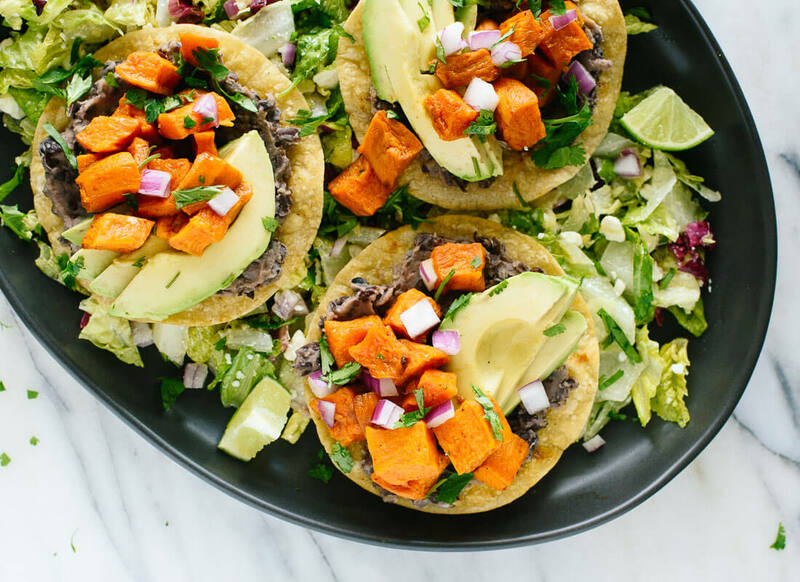 This vegetarian tostadas recipe features roasted sweet potatoes and healthy “refried” black beans, served on a bed of crisp salad. It’s gluten free and easily vegan (see recipe notes). This recipe yields 4 generous servings; leftovers keep well for a few days (see storage notes), or you can halve the recipe for fewer servings. To roast the sweet potatoes: Preheat the oven to 400 degrees Fahrenheit with two racks placed near the middle of the oven, leaving a few inches in between the racks. Line two large rimmed baking sheets with parchment paper to prevent sticking. Place the sweet potatoes on one of the prepared baking sheets, then drizzle the olive oil on top and sprinkle with the chili powder and several dash of salt. 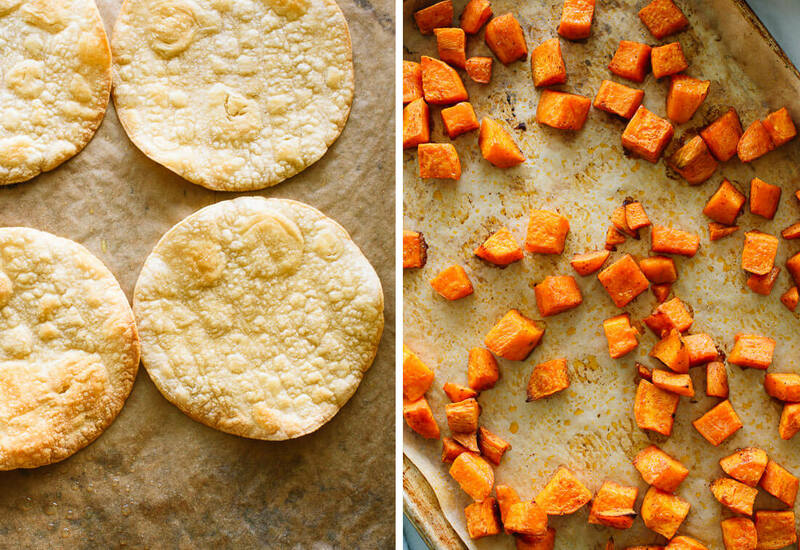 Toss until the sweet potatoes are lightly and evenly coated with oil and spices. Bake until the sweet potatoes are tender and caramelized on the edges, about 30 to 35 minutes. Set aside, but leave the oven on for the crispy tortillas. Meanwhile, to cook the refried beans: In a medium saucepan over medium heat, warm the olive oil until shimmering. Add the garlic and cumin and cook, while stirring constantly, until fragrant, about 30 seconds. Add the drained beans, water and salt. Let the mixture come to a simmer and cook for 10 minutes, stirring often, and reducing heat as necessary to maintain a gentle simmer. Remove from the heat and mash the beans with a potato masher, pastry cutter or fork until the mixture is thick and spreadable. Cover and set aside. To prepare the crispy tortillas: On the remaining prepared baking sheet, brush both sides of each tortilla lightly with oil. Clear off the other baking sheet by transferring the roasted sweet potatoes to a serving bowl, but reuse the parchment paper. Arrange 4 tortillas in a single layer across each pan. Bake for 10 to 12 minutes, turning halfway, until each tortilla is golden and lightly crisp. Set aside. To prepare the salad: In a medium serving bowl, combine the chopped lettuce, feta, about ½ cup of the red onion (reserve the rest for garnish), olive oil and lime juice. Toss to combine, and add a pinch of salt if the flavors don’t quite sing yet. Divide the salad between 4 low, wide salad bowls or dinner plates. To assemble the tostadas, spread black beans over each tortilla, and place each one on a bed of salad. 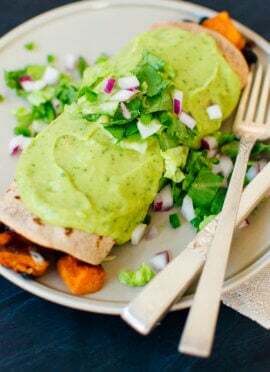 Top each tortilla with a few slices of avocado, followed by the sweet potatoes, and a sprinkle of red onion and cilantro. Serve with your favorite hot sauce or salsa on the side. Tostadas are best consumed promptly. If you have leftovers, store individual components separately, if possible. 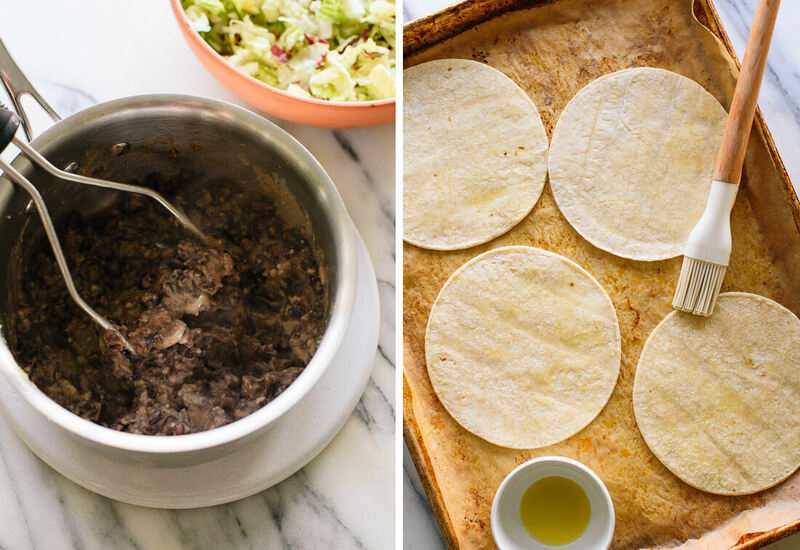 Leftover black beans make a good side, and they’re also a great quesadilla filling. Make it dairy free/vegan: Omit the feta cheese. You might like to add some pickled jalapeños or a few dashes of hot sauce to make up for feta’s salty kick. 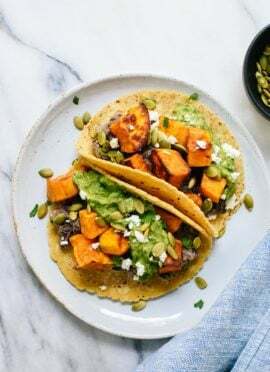 Change it up: These tostadas would be great with a variety of roasted vegetables, not just sweet potatoes! Cauliflower and butternut come to mind. You could also skip the roasted veggies for lighter tostadas. Storage suggestions: If you intend to have leftovers, it’s best to store individual components separately rather than assembling the tostadas all at once. If possible, store the salad and dressing separately, and toss only as much as you need together before serving. To put your mind at ease- tostadas are meant to be eaten with your hands, like tacos. Thanks, Rita! I make a mess of myself every time I attempt to eat a tostada with my hands. This tostada-on-lettuce trick is my favorite; hope you’ll give it a shot. This looks amazing! Adding to my grocery list now and making these this week! Thanks, Nikki! Hope you love them! Let me know when you do, Izzy! Looks delish and can’t wait to try it out. I think ALDI may be the only store using that system here in the U.S., but I hope it catches on soon! It just makes far too much sense. But yep, gotta keep those quarters handy! Never commented before, but my love for ALDI changed this. In post-grad low-paying job years that place saved me from succumbing to a life of rice and beans – I am so excited to see this partnership and hope others will now make their own ALDI discoveries! I can never seem to get my tostadas to come out crispy…I haven’t decided if its a temperature issue or to much oil on them. I’m going to give your technique a try and see if I get better results. I don’t normally flip mine so that could be it too. Thanks for sharing! You’re welcome! Let me know if they get crispy enough for you! Thank you, this is delicious! Easy, tasty and a full meal. Definitely a keeper. Looks nice too. I only added a diced jalapeno to the beans for some extra heat, as well as one more garlic clove. Personal preference only. I love all your recipes that I have made so far. Please keep it up. Jalapeno sounds excellent, Valerie. Happy you enjoyed this one! Just wondering what the calories and nutritional info on this delicious rr pie would be. I attend Weight Watchers and so am concerned with point values. The recipe sounds wonderful and I’d like to try it. 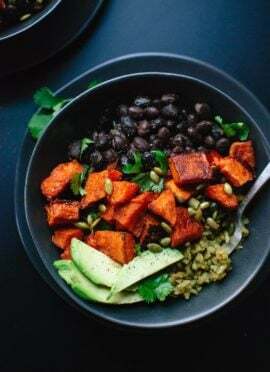 Black beans and sweet potatoes are one of my favorite combos! Yes! You can never go wrong. sweet potato! yummy! one of my most favorite ingredients! I absolutely cannot wait to try this! Yummy!!! Meatless tostadas are definitely my thing! I have a feeling this will become a Friday regular……. These tostadas are delicious and fresh! Exceeded expectations! Whole family LOVED! Thank you! Thanks, Nicole! I can’t wait for you to see it. And yes, this one’s good for a crowd! I made this recipe as written and my husband and I really liked it. I love the addition of serving on a bed of romaine. Just overall a beautiful little meal. Thank you. You’re welcome, Kathy! So happy you and your husband enjoyed. I was in Nashville over the weekend and after reading this post we decided to try Bakersfield. I also had the papas tostadas (with an added fried egg on top) and they were delicious. Will for sure try out your recipe next! Hi Jennifer! I’m so glad you enjoyed the tostadas at Bakersfield. Hope you love these, too! We made this a few nights ago and thought that the flavors were on point! My husband and I love your other tex mex sweet potato recipes. My only comment is that this were kind of hard for us to eat (even with the bed of lettuce) BUT we both agreed that this recipie was a “make again” (although next time it will probably just be all the components in salad form. Less elegant, but easier to eat!) ALSO I noticed your cookbook has a “look inside” option on Amazon and I just about died. Oh my gosh, Kate! It looks gorgeous! (Insert all of the heart eyes emojis) It can’t come out fast enough!! Woahhhh, that is news to me! Thanks, Sarah! Eep, I’m so nervous now that it’s available to see. Thank you for all the heart eyes! Anyway, I’m glad you enjoyed this one. I think I ate my tostadas with a fork and a paring knife, and that worked well enough. Salad form sounds delicious, too! We made these tostadas last night, and they were delicious! We opted for the vegan option without the feta cheese, but otherwise followed the recipe. We love the mix of flavors and textures, especially with the crunchy tortilla and the lettuce with lime. We will definitely make them again. Thanks so much for the inspiration. And we love ALDI too, and are excited that they sponsored the post! Thanks for this delicious recipe! I had a bad cut on my finger which inhibited my ability to peel and cut the potatoes so I made one small change – I baked the potatoes then scooped them out, smashed them, and seasoned them. When I layered the tostadas I made the first layer the smashed sweet potatoes. I topped the smashed potatoes with partially mashed black beans and the rest of the layers according to this wonderful recipe. DELISH!! 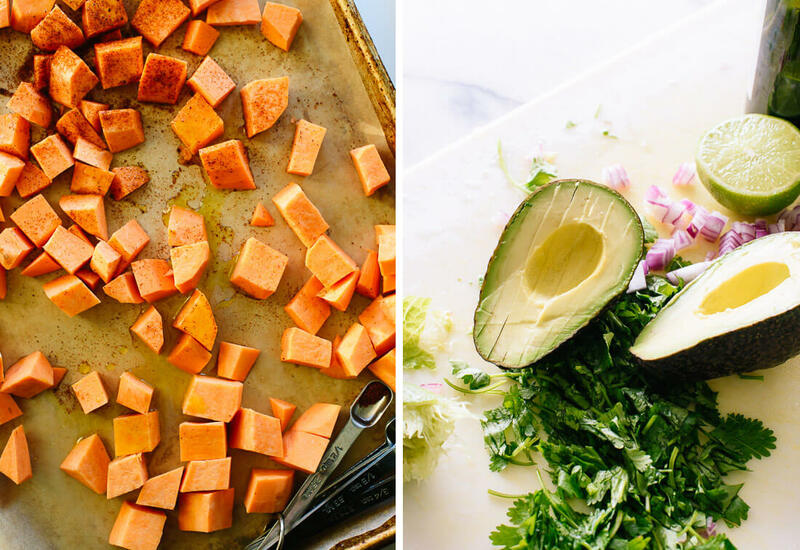 This is a delicious, filling, and healthy meal – loved the sweet potatoes! Oh wow, these were SO GOOD! I have already added them to my mental list of “old standby” dinners. I think I could eat them every night! Made the tostadas only last week and they turned out delicious! I just roasted the yams whole in their skin, no chili powder added sprouts and some Greek yougurt to top! Your version sounds wonderful, Sharon. Thanks! This was amazing!! Thank you. Sooooo good! Thanks for all the wonderful recipes-I love your site! So glad you enjoyed it, Stacy! I just made these and they were as delicious as they were pretty as they were messy. We’ve never had a tostada night since I hate to fry foods in my kitchen and the store bought tostada shells are gross. Don’t know why I never considered using the oven, but they came out great. Thanks for always being a great recipe resource – I think tostada night is now in the rotation! I’m happy it worked out, Wendy! Tostada Tuesdays, maybe?? I made these tonight and they were delicious. I did, however, add one thing that took them over the top. I made a vegan Mexican crema by blending 1 avocado, 1/4 cup of canned full fat coconut milk, 1tablespoon of lime juice and 1/4 tsp of salt. I blended until very creamy and put it in a squirt bottle. After assembling the tostadas, I drizzled crema over the top. It gave some much needed moisture and velvety texture. Great recipe. Thanks for the post. That crema sounds absolutely delicious, Laurie, especially to cut through some of the spices in the tostadas. It also sounds really pretty, presentation-wise. Thanks for the tip! I made a lazy, too-tired after school version of these tonight. Pan warmed tortilla, feta next so sweet potatoes and black beans helped melt it a bit. Topped with avocado slices, salt, pepper, lemon juice and dash of hot sauce on top. SO yummy. Looking forward to trying more recipes! These tostadas are AMAZING! I have made them many times now, and they are the most perfect and satisfying dinner. The flavors sing so harmoniously together. Thank you so much for this delicious recipe! Awesome!!! I made these last night for a girlfriends get together and it was a massive hit, everyone absolutely loved them! Will absolutely be making them again – probably this weekend! The flavours are clean, fresh and SO yummy! The only change I made was to make a pico de gallo in place of the salsa. Fantastic! I’m so glad everyone enjoyed these, Sheila! I hope the reprisal is just as good as the first time. Thank you for this post, it’s helpful especially since I shop at Aldi and makes it easier to know what to shop for. I will try this today. Great! Thanks, Vie. Enjoy your cooking! I had arugula, no Romaine – and I think that might be what I use next time. Complimented the other flavors well. You’re welcome, Leigh! Sounds delicious. I was at the grocery store, lost on what to make that night. Searched online and came across this recipe. I skipped the black beans and chili pepper, just not a fan. I thought since I modified the recipe, I messed up the whole recipe. But man, with all the flavor, this meal was AMAZING! It was so tasty and satisfying. My meat loving family was thrilled with it too, which is a hard crowd to please. THANK YOU for this recipe and giving me more options to try! Outstanding flavors! I’ve made this recipe 4x’s in the past two months. My husband and I get cravings and could easily eat this weekly!!! This is definitely a keeper recipe. I just made (sort of) this and really loved it. I didn’t have regular black beans, so I used drained (but not rinsed) Goya black bean soup as the black bean portion (by itself, without any of the prep or ingredients here). I also used bigger tortillas and put the salad in the tortilla with the other ingredients. We really loved it! Awesome, Natalie! Thank you, for your feedback and review. Tried this last night. I was tasting the different components as they came together and they were all delicious. When we combined them: phenomenal. Thanks so much for another great recipe!! Absolutely fresh and delish! I made this recipe exactly as written and the spice combinations are perfect. Thank you for another winner.